Who is Colder? Calgary, Edmonton, Regina, Saskatoon or Winnipeg? 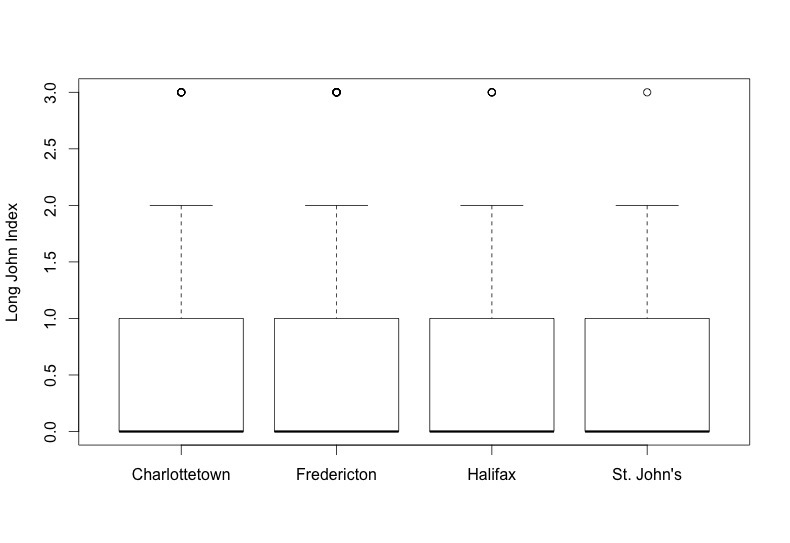 "I used the same method as when I compared Saskatoon and Regina (comparing the medians, detecting a difference when p < 0.05), but ramped up to compare more than 2 groups. This is called a Kruskal-Wallis test. To look at differences between individual cities, we have to look at the graph. So, do western cities have different long john indices? Yes! (p< 0.001). From the graph, we can see that Calgary < Edmonton = Regina < Saskatoon < Winnipeg (i.e., Calgary is the warmest, Winnipeg the coldest, and Regina and Edmonton are the same). Make sense? First, if we look at the plot (east.jpg), there doesn't seem to be much difference. And indeed, the Kruskal-Wallis test gives us p = 0.107 - that is, this pattern could be due to chance 10% of the time. Since we decided that 5% was out cut-off, we must conclude that there are no differences among eastern cities. And here's a special BONUS STATISTICAL ANALYSIS! What about the NORTH? I'm glad you asked. 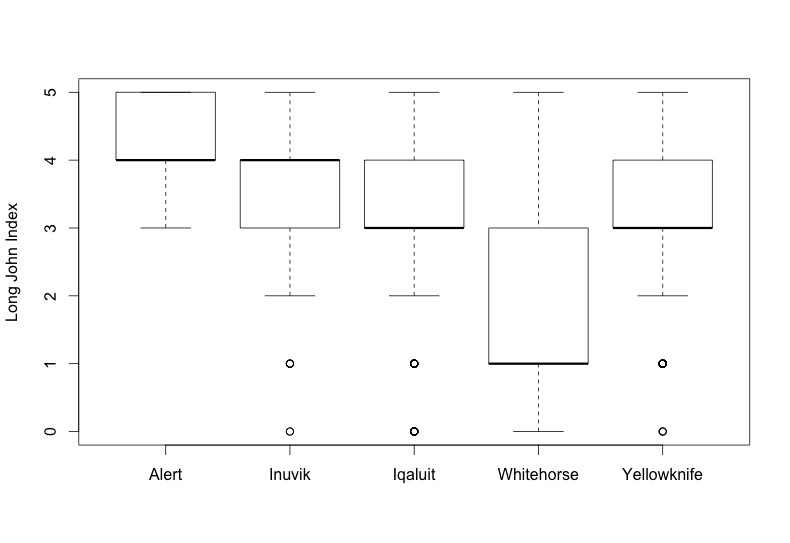 The Kruskal-Wallis test comparing Iqaluit, Yellowknife, Whitehorse, Innuvik, and Alert shows a significant difference (p < 0.001). To the box plot! Not surprisingly, Alert is the coldest, followed by Inuvik. Iqaluit and Yellowknife appear to be on par, and Whitehorse is the warmest of the North." Earlier this year, we were approached by one of our biggest boosters, Dr. Alex ( @thelabandfield) about doing a little bit of background work, and taking a look at the Long John Index as advanced statistics! Seeing as how all the interns are rudimentary computer nerds, and not barely qualified to spell 'statistics' we were excited to see what could be found once you started 'crunching the numbers' so to speak. The first thing that Dr. Alex suggested, was to see whether one of our favorite Long John Index-isms, that 'Saskatoon is always colder than Regina' is true or not! Could it be True, or are we just making things up? Take it away, Dr. Alex! "First, a quick stats backgrounder. The Long John Index is a kind of data called "ordinal integer data"; that is, a LJI of 2 is not necessarily twice as much as 1, and there's no LJI of 1.72 (whole numbers FTW!). We can compare these two datasets using a Wilcoxon Test, which looks for differences in the medians (basically the "average" for this kind of data). I then looked at the probability that any differences between the two datasets was the result of chance alone (the "p-value"); anything with p < 0.05 is generally considered to indicate a real difference that's not due to chance (i.e., 95% of the time [this is the "19 times out of 20" we hear in political polls], the difference we see is caused by something other than random chance). Make sense? To test whether Saskatoon was colder than Regina, I used the 134 days of combined 2011-12 (n=97) and 2012-13 (n=37) Long John Index observations. At a first glance, there didn't appear to be any difference between the two cities: p = 0.49 (so there was a 50/50 chance any pattern was due to chance / random noise). But when I plotted the data (see the graph "saskatoon-regina.png"), it looked like Saskatoon could indeed be colder. So I did what's called a "paired test", which looks at the observations from the two cities on any given day, and compares them (rather than across the whole winter). Doing this, we see that Saskatoon IS colder than Regina (p = 0.007; i.e., a 99.3% probability that there's a pattern not due to chance). This became quite evident when I looked at the differences in Long John Indices between the two cities (i.e., the LJI of Saskatoon minus that of Regina). Values > 0 mean it's colder in Saskatoon, and values < 0 mean Regina is colder. Of the 134 observations, the cities had the same LJI 111 times (83% of the time). BUT! 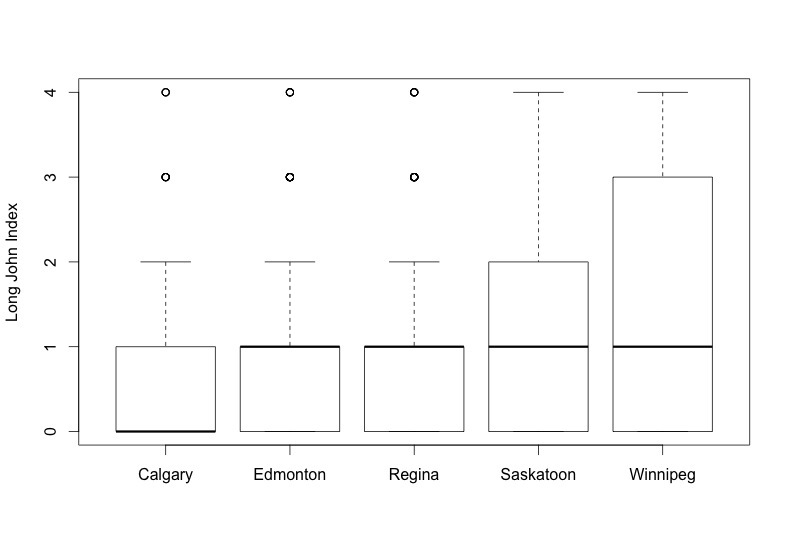 When the cities don't have the same LJI, Saskatoon is one point higher than Regina 11 times, and two points higher 4 times (15/134 = 11%), while Regina is only ever colder than Saskatoon 4 times (3% of the time, and only by 1 index point). See "yxe-yqr differences.png". So there we have it - scientific proof that Saskatoon is colder than Regina."